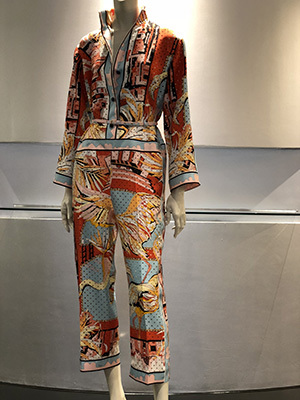 KALEIDOSCOPIC PRINTS AND FINELY DRAPED FABRICS COME TO MIND WITH THE NAME EMILIO PUCCI, THE ITALIAN HOUSE ESTABLISHED IN 1949 THAT WOULD GO ON TO SIGNIFY LUXURY IN THE 1960S. WITH MSGM FOUNDER MASSIMO GIORGETTI TAKING CHARGE OF THE ICONIC BRAND, PUCCI’S LATEST WOMEN’S COLLECTIONS DELVE INTO THE ARCHIVES FOR THE DEEP CUTS FROM COLLECTIONS PAST THAT RESONATE WITH THE ADVENTUROUS STATE OF CONTEMPORARY FASHION. HIGH-OCTANE PALETTES ARE MANIFESTED IN A WHIMSICAL YET PROGRESSIVE ARRAY OF TEXTURAL CONTRASTS. GIORGETTI’S REINTERPRETATIONS OF BLOUSES, TROUSERS, AND SKIRTS RUN THE GAMUT FROM SILK TO FEATHERS TO BEADING TO METALLIC FABRICS; EVENING DRESSES AND ACCESSORIES ARE FASHIONED WITH AN ARCHITECTURAL SLANT AMPLIFIED WITH COLORBLOCKING AND LUXE EMBROIDERY.